When your parent enters into the “senior” age bracket, your dynamic naturally changes, and with this can come some awkwardness. You are responsible for their care, but they aren’t a child, which makes it a lot more difficult to get them to cooperate. 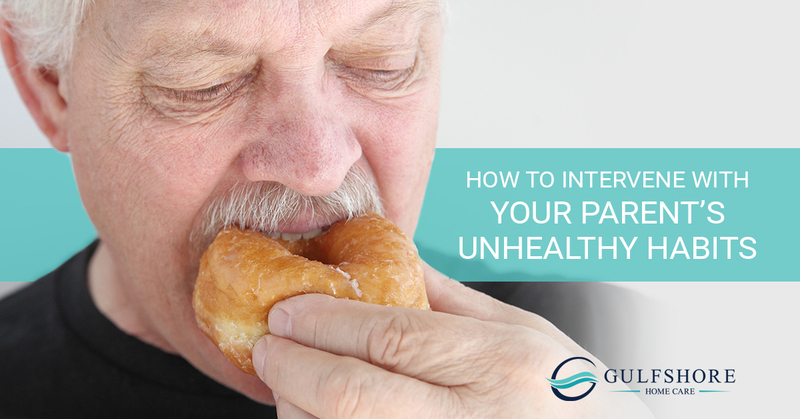 Your parent may be particularly stubborn about letting go of certain unhealthy habits. If this sounds familiar to you, you understand the struggle of caring for an elderly parent who is set in their ways. Maybe they insist on smoking even though the doctor has told them they have to quit due to their heart condition. Perhaps they refuse to take their medication, won’t eat vegetables, or avoid exercise like the plague. Whatever the particular habits, it may be a source of great stress to you that they won’t let go of them. But how do you teach an old dog new tricks? In this blog, we will go over tips on how to convince your elderly parent to adopt healthier ways of life. It’s important to have empathy for your parent in this situation. They have lived independently their entire life, making their own choices, and now you’re coming in and insisting they change their ways. If you’re coming from a place of judgment, they are going to interpret it as condescending, and they’re likely to throw up walls, ignore you, or deflect your efforts. Don’t talk to your parent about this issue; talk with them. It might help to approach it with a playful, joking manner. Casually talking about these habits may make your parent feel more comfortable and create a safe space for you to talk more openly. Keep it light, then gently introduce the idea of your concern for their health. Using humor can help the medicine go down easier, so to speak. Consider the expectations you have for your parent and whether they are truly realistic. You may really want them to start eating healthy, but this isn’t going to happen overnight just because you told them to. Habits are built slowly over many days, particularly for people who have been living life in a certain way for decades. Start small to support them in changing. For example, let’s say your dad always eats pork rinds, which spoils his appetite for dinner. Get to the bottom of this habit. Sure, he may just enjoy the taste, but also consider other factors, such as the fact he can’t cook for himself or that pork rinds are readily available when he’s hungry. Preparing him meals in advance so that he can access healthy food when he’s hungry can make an enormous difference. In addition, consider picking up a healthier alternative to pork rinds, such as veggie chips, so he can still snack as he likes, but on something a bit better for him. Keep in mind that a habit like smoking will take much longer to leave behind because addiction plays a role. Be extra patient with them, particularly if they have been smoking for years, and don’t lecture them — they’re aware of the overwhelming body of evidence that smoking kills. Instead, focus on finding a healthier habit they can replace it with, and talk to them about how their smoking impacts the family. At Gulf Shore Private Home Care, we would love the opportunity to help you care for your elderly parent with our home health care services in Naples. If you’re interested in learning more, contact us today!